Diving Deeper Audio Podcast: What is a nautical chart? Diving Deeper Audio Podcast: What is hydrography? NOAA ships and scientists, along with multiple partner organizations, have returned to Kachemak Bay, Alaska, for the second field season of hydrographic data collection. The goal of the project, called ‘Hydropalooza,’ is to develop the most detailed sea floor and coastline maps ever generated for this area. Kachemak Bay, one of south central Alaska’s most productive and ecologically diverse estuaries, also supports maritime commerce, ferry transportation, fishing, and recreational boating from the nearby harbors of Homer and Seldovia. Up-to-date NOAA nautical charts, as well as sea bottom, water level, and shoreline information, are needed to ensure safe navigation, manage coastal resources, and support local planning. 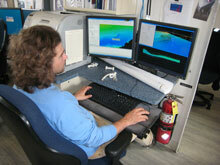 A NOAA hydrographer analyzes multibeam data and pinpoints navigational obstructions on the bottom of Kachemak Bay. Crews on board the NOAA Ships Fairweather and Rainier will conduct hydrographic surveys of the sea floor, measuring depths and identifying obstructions. When the ships complete data collection in early September, they will have surveyed over 350 square nautical miles—an area nearly twice the size of Chicago. The data and maps collected will be used by state and local officials to make better informed decisions related to the coast, its habitats, and its people. Mapping data, traditionally used to ensure safe transits to and from America’s ports and waterways, is now in demand by other organizations for a multitude of needs including monitoring for storm surge and sea level rise as well as homeland security planning. Ocean and coastal mapping data collected during 'Hydropalooza' will be shared with local officials for use in characterizing and protecting marine habitats. In addition to collecting detailed mapping data needed to update nautical charts and sediment data, the vessels will also install new tide stations and high-precision global positioning system base stations. These stations will record water levels and location information in real time. With Kachemak Bay having a 28-foot tidal range from low to high tide — the fourth highest in North America — these data are needed to ensure the best quality surveys are conducted. Scientists will also conduct sediment sampling to assess pollutant levels and biodiversity on the sea floor. ‘Hydropalooza’ is a great example of collecting a suite of data that can be used for multiple purposes, maximizing the benefits for all users. “Coastline and sea floor data, once collected solely for updating NOAA’s national suite of nautical charts, is now used for marine spatial planning, ocean circulation monitoring, and assessing the impacts of climate change, among other uses,” said Captain Roger Parsons (ret. ), from the Office of Coast Survey.